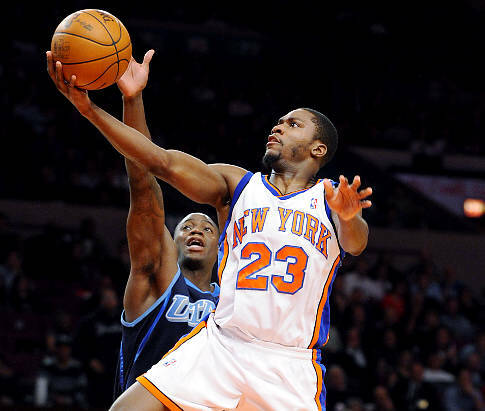 Through five games, the breakout star of the Knicks' return to relevance has been, without question, Toney Douglas, a second year guard out of Florida State. Coming off the bench, Douglas is averaging 16 points, four rebounds, two assists and two steals in just 28 minutes. He's shooting 50 percent from the field, 38 percent from beyond the arc, more or less his career average. On Thursday night, during a nationally televised game, Douglas put up an impressive 30 points in 30 minutes against everybody's favorite point guard Derrick Rose, as the Knicks beat up the Bulls, in Chicago. A resounding victory made even sweeter when, before the game, Charles Barkley announced to America that the Knicks ain't no good. Last night, Douglas showed off his defensive abilities. He hawked five steals while forcing, along with Raymond Felton et. al, the golden-shod John Wall into 10 turnovers. At the same time, Douglas also grabbed 10 rebounds and put up an easy 19 points. What I enjoy most about Douglas' emergence is, Knicks fans saw this coming, almost from the start, unlike nearly every NBA pundit who panned, mocked even, New York's lack of talent during the Summer of Lebron. Like I said in July 2009, the kid 's got game.